Try to watch the kittens nursing at least once a day, if mom will permit it. Check that everyone is nursing and that there isn’t too much jockeying for position. A great deal of activity and crying could indicate a problem with milk flow, quality or availability. When the mother reenters the box, there should be some fussing for only a few minutes before everyone has settled down to eat. Bottle feed ½ tablespoon formula every two to three hours. Newborns can nurse up to 45 minutes at a time. The kitten should be taking in four milliliters of formula for each ounce of body weight within a 24-hour period. This amount should be divided up into at least six feedings for the first week (one every four hours). The temperature of the nest box should be between 85 and 90 degrees. Chilling is the No. 1 danger for newborn kittens. 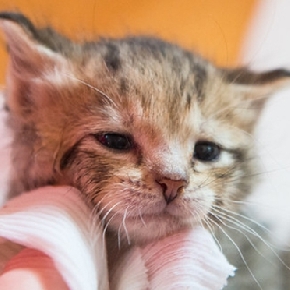 At one week old, kittens should weigh 4 oz. They should be handled minimally. Continue to watch the kittens to ensure that are all nursing. If a kitten is not nursing, bottle-feed him formula per manufacturer's instruction every two to three hours until he is full but not bloated. Usually kittens will consume at least half a tablespoon of formula per feeding. Floor temperature of the nest box should be between 80 and 85 degrees. 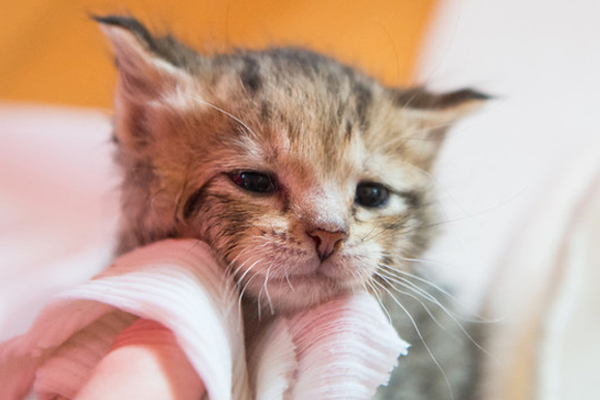 Two-week-old kittens should weigh about 7 oz. Ear canals open between five and eight days. Eyes open between eight and 14 days. They open gradually and usually start to open from the nose outward. Healthy kittens will be round and warm, with pink skin. If you pinch them gently, their skin should spring back. When you pick a kitten up, it should wiggle energetically. Healthy kittens seldom cry. Continue to watch the kittens to ensure that that are all nursing. If a kitten is not nursing, bottle-feed him formula every two to three hours until he is full but not bloated. Usually kittens will consume at least half a tablespoon of formula per feeding. Floor temperature of the nest box should be between 75 and 80 degrees. Kittens will weigh about 10 oz. Kittens begin to crawl around day 18 and can stand by day 21. They will begin to play with each other, biting ears, tails and paws even before their teeth have come in. Their milk teeth are cut during this period. Kittens learn to sit and touch objects with their paws. Kittens begin their socialization phase. To socialize kittens, increase the amount of handling to get them used to human contact. It is important not to expose them to anything frightening. Children may seem intimidating and should be supervised closely while visiting. Young children should not handle the foster kittens. Continue to watch the kittens to ensure that that are all nursing. If a kitten is not nursing, bottle-feed formula every two to three hours until he is full but not bloated. Usually kittens will consume at least half a tablespoon of formula per feeding. At this stage, kittens may start lapping from a bowl. Floor temperature of the nest box should be between 70 and 75 degrees from this point onward. Kittens will weigh about 13 oz. Adult eye color will begin to appear but may not reach final shade for another nine to 12 weeks. Kittens begin to see well. Their eyes begin to look and function like adult cats' eyes. Continue to watch the kittens to ensure that that are all nursing. If a kitten is not nursing, bottle-feed him three tablespoons (1-1/2 oz.) of formula every eight hours. Weaning: Kittens can usually drink and eat from a saucer by four weeks. Weaning should be done gradually. The mother will generally start to wean her kittens by discouraging her kittens from nursing. Some cats, particularly those with small litters, will allow nursing until the kittens are old enough for permanent homes. Even if kittens are nursing, they may not be getting all the nutrition they need from mom. It is important to make sure they are eating food and gaining weight. Starting solids: Introduce them to solid food by offering warmed canned food, mixed with a little water into a gruel, in a shallow saucer. You can begin by placing one kitten by the plate of food and hoping for the best. Her littermates will probably copy her and do the same. They also will walk in it, slide in it and track it all over the place. Some will prefer to lick the gruel from your fingers. If they start by licking your finger, slowly lower your finger to the plate and hold it to the food. Sometimes it takes two or three meals before they catch on. If a kitten does not seem interested enough to even sniff your finger, try gently opening his mouth and rubbing a little of the food on his teeth. Hopefully they will start licking your finger. If they're still not getting the idea, you can take a syringe (without a needle) and squirt a small amount of gruel directly into the back of their mouths. Be sure the kittens have access to fresh water in a low, stable bowl. Kittens will weigh about 1 pound by four weeks old. Begin litter training at four weeks. Use a low box with one inch of nonclumping litter or shredded newspaper. Do not expose the kittens to the clumping variety of litter. It is harmful if ingested. After each feeding, place the kitten in the box, take his paw and gently scratch the litter. Be patient! He may not remember to do this every time or may forget where to find the litter box. Be sure to give the kittens lots of praise when they start using their boxes. Most will use it from the start, but like other babies, might make an occasional mistake. It is a good idea to confine the kittens to a relatively small space. The larger the area the kittens have to play in, the more likely they will forget where the litter box is. Keep the litter box clean and away from their food. Continue weaning the kittens. Feed gruel four times a day. Thicken gruel gradually. Introduce dry food and water. Some kittens will not like canned food. For reluctant eaters, try mixing any meat-flavored human baby food with a little water. The meat flavor is often more appealing to the picky eaters. Be sure the brand you get does not contain onion powder. This ingredient can be hazardous to kittens. At five weeks old, kittens will weigh around 1 pound. They can start to roam around the room, under supervision. The strongest, most curious kitten will figure out how to get out of the nest. The others will quickly follow. Play with your foster kittens daily. It is a good idea to wear long sleeves and pants. They can play roughly, and their claws are sharp. If you sit on the floor, they will play "King of the Mountain." In this game, they will crawl on you, using your knees and shoulders as vantage points and knocking off their littermates in the meantime. This game is a lot of fun and good exercise for them. Some kittens may be fearful at first; do not force yourself upon them. Get them used to your presence by sitting in the middle of the room making phone calls. This way they hear your voice but do not feel threatened. Feed the kittens at least three meals daily. They should be eating canned and dry food well. If one kitten appears food-possessive, use a second dish and leave plenty of food out so that everyone is eating. Bear in mind that a kitten at this age has a stomach roughly the size of an acorn. They may not eat much at a single sitting, but they like to eat at frequent intervals. By this time, you have "mini-cats." They will wash themselves, use scratching posts, and play games with each other, their toys and you. Many will come when you call them. 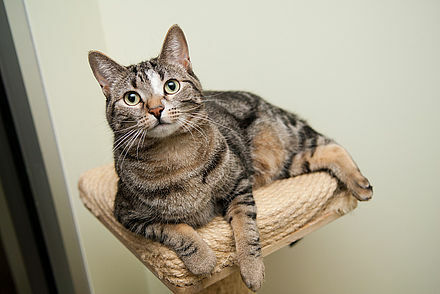 Be sure to reintroduce them to their litter box after meals, during play sessions and after naps. These are the usual times that kittens need to use the litter box. Offer wet food three to four times a day. Each kitten will be eating a little over one can of food per day. Leave down a bowl of dry kibble and water for them to eat and drink at will. If you have a litter with a mom cat, she should only be allowing brief nursing sessions, if any. Do not feed the kittens any table scraps. Offer wet food two times a day. Leave down a bowl of dry kibble and water for them to eat and drink at will. By the end of the eighth week, kittens should weigh 2 pounds each. They are also old enough for early spay or neuter and potentially adoption.